Food & Function is pleased to be sponsoring Food Matters Live 2017. 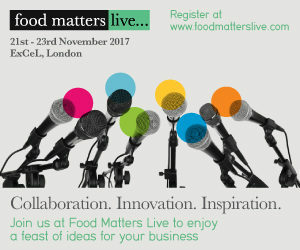 Food Matters Live is the UK’s fastest growing cross-sector event showcasing innovation in the food and drink industry and it returns to London’s ExCeL from 21 – 23 November 2017. Register for free entry. Celebrated chef Heston Blumenthal, former Sainsbury’s CEO Justin King and neuroscientist Baroness Susan Greenfield will head up an all-star cast of 400 speakers across 100 free-to-attend conference and seminar sessions at Food Matters Live 2017. Read more. • The Awards – designed to celebrate inspiring innovation and creativity from across the food and drink industry. • Match – a matchmaking service offering both exhibitors and visitors the opportunity to pre-arrange meetings onsite at Food Matters Live. • Food futures seminars– These new seminars will focus on the innovative products, processes and new technologies shaping the future of food and drink production and business.